I hope you won’t mind today’s post. It’s purely promotional. The original idea for having a blog was to promote my work in one fashion or another. Get more gigs. Sell more books. I’m basically a soft sell guy but now and then when a new book comes out or something nice happens I take advantage of this space to talk about it. I did a school visit last month in Kirksville, Missouri and received this note from Robyn Pasa, the librarian. I don’t do as many school visits as I used to, but I like to visit a few schools each year to stay in front of kids. If you know of anyone who might find this recommendation useful, I hope you’ll be kind enough to pass it on. Otherwise, pour another cup of coffee and skip to someone else’s blog today. Thanks. Kirksville Primary School hosted David L. Harrison as a guest author as part of our Fine Arts Program on April 16, 2018. I recommend him as a visiting author to your school. April 16, 2018 was a jam-packed day of laughter, listening, reading, writing, and sharing. Mr. Harrison did a marvelous job of keeping our 560 Kindergarten through Second graders engaged and encouraged as authors themselves. David told stories, shared some of his poetry, along with where he finds his ideas and what he does with them as a writer in the introductory session. He then met with each grade level, two sessions each, and gave them an ‘assignment’ to work on for the last session of the day ‘Student Sharing’. 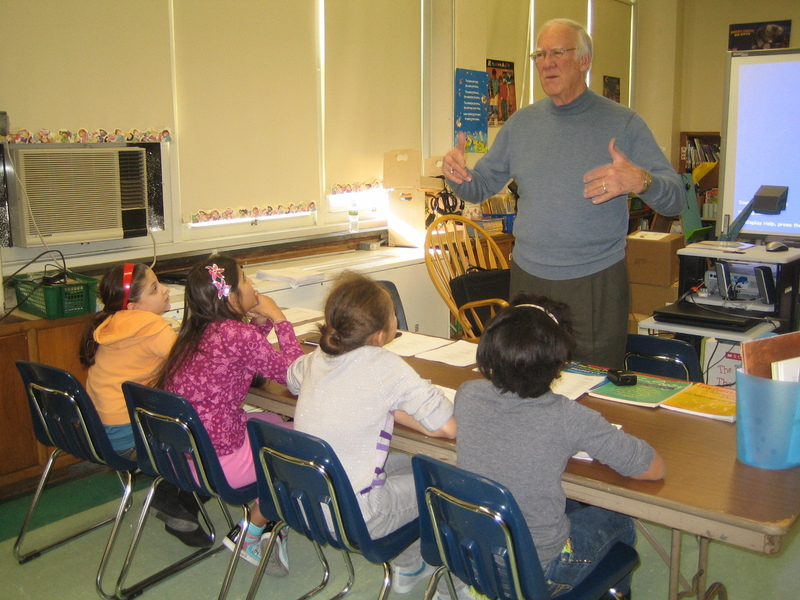 Our students were up for the challenge and felt validated by Mr. Harrison’s instructions and feedback, as each grade had several readers of poems, narratives and offered sound effects to help tell a story. Mr. Harrison is articulate, humorous, and very knowledgeable in the craft of writing, as an author and educator of educators. David is very timely in his responses, clear in what he could offer our school, and what he needed in return from us to ensure a successful day for everyone. My administrator and faculty had high praise for David Harrison and the day we shared with him. I feel you will enjoy and appreciate the time you spend in his company. It has been ages since I adjusted my fee for school visits. I love to do them but my price is higher than a lot of budgets can handle. My friends Roland and Marie Smith just returned from a 20,000 mile jaunt around the country making school visits, which is what got me thinking about the subject again. I haven’t decided for sure yet, and I’m booked for the rest of this year anyway, but I might drop my fees for next year to get closer to the going range. I can’t get away to make extended trips like those whippersnappers the Smiths, but I would enjoy seeing a few more students than I have been lately, maybe on the order of half a dozen or so more schools. Decisions, decisions. REMINDER: If you are interested in participating in my poetry workshop at the home of Highlights in Honesdale, Pennsylvania, there are 5 spots left. I set an upper limit of 12 and I believe we’re already up to 7 who have been accepted. We’ll kick things off at 3:00 PM on Thursday, June 2, with a tour of HIGHLIGHTS FOR CHILDREN (R) and Boyds Mills Press. I’ve published 27 books with Boyds Mills and love my occasional stays at the original home of the founders of the company. The workshop takes place on the grounds and inside the comfortable house. We’ll be together all day Friday and Saturday and wind things up after lunch on Sunday, June 5. I’ll mix the menu so you’ll have plenty of time between group sessions to be alone with your thoughts and court your muse against a peaceful, forested backdrop. If this workshop sounds right for you and you want more information, contact the Foundation directly by telephone at 570-253-1192. Or, e-mail the director at contact@highlightsfoundation.org . I’ll hope to see you in Honesdale. Over the months we’ve been enjoying Word of the Month Poetry Challenge, many of you have become accustomed to seeing good poems consistently posted by students of Jana Smith and, more recently, students of Nanette Valuck, who teach at Maumee Valley Country Day School in Toledo, Ohio. One of the nice things that has happened because of my blog is that Jana and the administration of her school have invited me to fly to Toledo and visit with the students and teachers at MVCD. I leave tomorrow morning. I’ll meet with parents tomorrow night during a program designed to demonstrate some of the many uses of poetry. On Friday I’ll visit students in each grade from 1st through 6th. I look forward to the opportunity. I’m already impressed by all the work going into the preparations for my visit and I’m sure I’ll come home with good stories and fond memories. Stay tuned. BULLETIN: This morning my blog registered its 60,000th visit. Thanks to all! REMINDER:Tonight at 10:00 CST is cutoff for this month’s Word of the Month poems!!!! Here’s my Weather poem. I nearly missed the cutoff! I can’t seem to get my mind off storms. The published poem I posted earlier was stormy and so is this one. 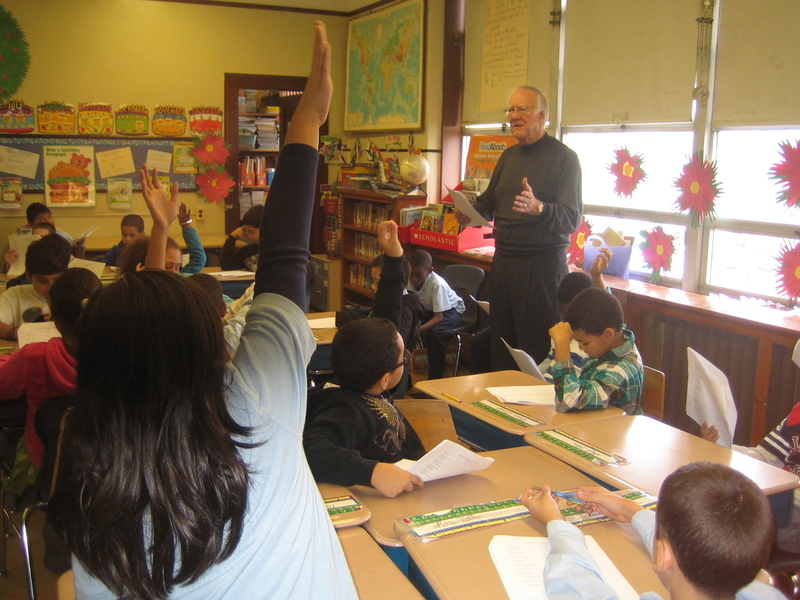 Here are some pictures taken when I was working with students in Paterson last week. I’m home now for several weeks and look forward to enjoying the holidays with my family and catching up on answering and filing 1,000 e-mails. Tomorrow I leave for Paterson, New Jersey to spend three days in schools. I look forward to meeting students and working with their teachers. My thanks in advance to Dennis Vroegindewey for writing a successul grant that includes me as poet for the project. I look forward to meeting Dennis in person as well as seeing Bill and Beth Johnson again when they drive to Paterson for part of the event. Bill spent many years with Highlights before joining Zaner-Bloser and Beth was an elementary school teacher. If you are familiar with my “Poetry Basket” from Boyds Mills Press, Bill was instrumental in selecting titles and Beth wrote activites for them. On Monday I’ll be in School 24 where Steve Rodriguez is principal. Jennifer Reynolds is principal of School 26, where I’ll be on Tuesday. Wednesday is School 29 where Carlos Ortiz is principal. It’s a safe bet that I’ll do my best to entice a few more teachers to join us in the Word of the Month Poetry Challenge!